2 What is Electrical Stimulation? 3 When should I use Electrical Stimulation? 4 How do I use Electrical Stimulation? Welcome to this online learning resource on the use of electrical stimulation (ES) to support recovery of upper limb following a stroke. This page has been created by a small group of final year physiotherapy students from Queen Margaret University as part of the Contemporary and Emerging Issues in Physiotherapy module. This resource aims to provide an interactive learning package for final year students and newly qualified physiotherapists to develop their knowledge and understanding of ES application for upper limb recovery following a stroke. A balance of theory, policy and evidence-base, as well as practical aspects for application of ES has been incorporated.Although this resource details some of the practicalities involved when working with ES, this alone is not sufficient training for using this modality in clinical practice. Please seek further guidance and training from experienced clinicians in your clinical area before using ES as treatment. The learning outcomes described in figure 1. have have been constructed using blooms taxonomy  to guide the expected level of competency, and is aligned with those expected of a newly qualified physiotherapist, described in the knowledge and skills framework (KSF). Link to the physiotherapy band 5 role profile can be found in the resources section at the bottom of this page. Figure 1. Learning outcomes mapped to Blooms activity verbs. This package should take approximately ten hours to work through, however, this should be viewed as a guide only as people have varying learning styles and preferences. To support this the sections have been designed in a way which enables users to dip in and out to suit their needs. Users can choose to work on their own, or benefit from discussing and reflecting on the activities with others, such as peers, colleagues and managers. This choice is left to the user to match with their own preference and time-management. At the start of each section, a brief description of what will be covered is outlined and linked to the above learning outcomes. This learning resource aims to be engaging and interactive. While synthesis and summary of the key information has been provided, the user will gain greater benefit by engaging with the directed reading, videos, activities, short quizzes and case studies that have been developed to support a deeper learning experience in line with adult learning theory . A range of material has been incorporated in the design of this package to try and suit different learning styles. VARK Learn Ltd (http://vark-learn.com) offer a tool that helps people identify their own learning preferences and maybe a helpful activity prior to commencing this resource. Figure 2. below outlines the content covered in the main sections of this resource. Figure 2. Outline of main sections with mapped learning outcomes. Stroke has a large impact and burden on society . It is currently the 4th largest cause of mortality in the UK  Although trends show decreased mortality rates over the last 20 years, it is still the leading cause of complex adult disability . The UK has approximately 1.2 million stroke survivors, with half experiencing disability and 77% with upper limb difficulties . In the UK the over 65’s population is estimated to rise by over 40% in the next 17 years , and stroke incidence is higher in this demographic. . This could potentially lead to even greater numbers of stroke survivors requiring support and rehabilitation from healthcare professions such as physiotherapy. Additionally, 36% of 65+ live alone  underpinning the importance of successful rehabilitation of upper limb function if people are to maintain independence, due to its impact on performance of activities of daily living . Physiotherapists are a core member of the multidisciplinary team required to rehabilitate stroke survivors . Their main goals are to enhance people’s functional abilities, helping them improve or maintain their mobility and independence. This aligns with Scottish policy of supporting people to live independently in their homes and communities longer . Physiotherapy interventions for upper limb recovery after stroke have moderate or low quality evidence, and there is insufficient data to draw comparisons as to which is most effective . Therefore guidelines recommend that practice should not be limited to one approach but should be based on the need and preferences of the patient . ES has a developing evidence base that supports its use for upper limb recovery after stroke  and the number of trials has quadrupled over the last decade . However, current practice is varied and research shows that a lack of knowledge and skills are a key barrier to its use . This learning package aims to addresses this contemporary issue by introducing and synthesizing key literature and translating this into practical recommendations that can support clinical practice. Several uses and benefits have been investigated regarding ES use in stroke upper limb recovery. These include strengthening weak muscles, increasing range of motion, reducing spasticity, improving motor control, reducing shoulder subluxation, reducing pain associated with shoulder subluxation and spasticity, improving sensory and proprioceptive awareness, and improving effects of botulinum toxin for management of spasticity , . Neuroplasticity is a key concept underpinning stroke recovery and it is the ability of the brain to adapt and form new neuroconnections . By forming these new synapses, motor-skills can be relearned and concepts of sensory-motor learning are founded on this premise . Following stroke there is evidence that the brain has a period of hyper-excitability within the first weeks after stroke and it is hypothesised that by affert stimulation central reorganisation can be enhanced by stimulation through movement which ES may be able to facilitate . Additionally there is large predictive probability (90%) of return of upper limb function decided within the first 5 weeks, indicating a critical window for influencing recovery. As will be reviewed in the following section (When should I use ES? ), evidence supporting use of ES is not conclusive   . This resource focuses on two key areas; shoulder subluxation and motor control as these are the only two supported by UK guidelines  . Figure 3. ES device and electrodes. There are various terms used within the literature for ES. Although each has a different meaning they are frequently used synonymously which can make understanding and comparing different studies challenging . Highlighted below are the most common terms encountered in the literature. This learning resource has focused on ES used to support upper limb recovery which is delivered predominantly by Neuromuscular Electrical Stimulation (NMES). Functional electrical stimulation (FES) and neuorprothesis are forms of NMES. Transcutaneous electrical nerve stimulation (TENS) has traditionally been used for analgesic purposes and does not elicit a motor response  although it has also been used in studies to promote sensory feedback. One distinction made is the use of ES for therapeutic purposes such as to aid motor learning with the intention of a carryover effect beyond treatment. Functional electrical stimulation on the other hand is aimed at providing direct benefit to aid a task at the time of wearing and is used in an orthotic manner . In normal physiology, nerve fibre recruitment occurs as described by the Henneman size principle of voluntary motor unit recruitment, whereby nerves with the smallest diameter will be recruited first. When using ES, the reverse of this happens, with the largest diameter neurons being recruited first due to a lower nerve stimulus threshold  which can lead to fatigue. However, it has recently been established that it is in fact an uncoordinated method of recruitment, with no order, that is evident in ES . One limitation of ES is that muscles can fatigue  and that the higher frequency selected, the quicker muscle fatigue will set in. Clinical judegement is required to determine the lowest frequency possible to achieve tonic muscle contraction. Once fatigue has set in, there is argument for and against whether muscle strengthening can occur. It has been suggested that when fatigued, that no advantages can be gained from additional stimulation and therefore fatigue should be prevented if possible. Opposing arguments suggest that strengthening can only be achieved if the muscle fibre is worked to its maximum. Clarifying the cause of fatigue is important. Strengthening can occur if fatigue is within the muscle fibres due to cellular processes being activated, however if fatigue has resulted from neurotransmitter depletion or propagation failure, then the muscle will not be strengthened as the fibre is not being stimulated sufficiently . 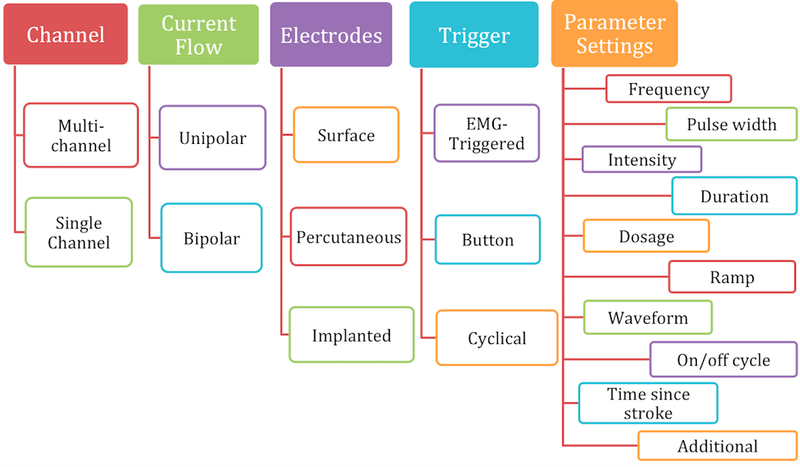 ES systems include three components: the control, an electrical stimulator and electrodes which connects the ES with the nervous system . There are several different ways ES devices can be configured as depicted and described below. This can vary by supplier and intended use. Figure 5. Overview of ES device and configuration. Application of ES is done via electrodes, which generate the electrical field through either surface or percutaneous electrodes .ES can be provided via single channel or multichannel devices. Multichannel systems can be used when targeting multiple muscles to replicate a functional activity such as reaching and grasping, whereas a single channel device is used for less complex movements such as rectifying shoulder subluxation. Although single channel systems are mainly used for simple movements, they are potentially more portable, making them more practical for home use. Surface electrodes are placed directly onto the skin over the nerves and are the most common . As well as stimulating muscle, surface electrodes may also be used to achieve a reflex action. Parameters of ES needed when using surface electrodes can differ depending on factors such as material of the electrodes, placement and surface area . They are non-invasive and relatively inexpensive and are suitable for use across a wide variety of settings and by therapists and patients, promoting independence and self-management . However, targeting contraction of small individual muscles can be difficult, and often activation of deeper muscles requires superficial muscles to be activated first. Surface electrodes have also been reported to cause pain for some patients when compared with percutaneous electrodes . Percutaneous electrodes penetrate through the skin into the muscle via hypodermic needles or can be completely implanted whereby stimulation is received from an external unit . They can address the difficulties faced with surface electrodes by being able to target deep muscles and as they use lower currents, are reported to be less painful . However, factors of cost and practicality need to be taken into consideration . In line with the SSAF  recommendations, this resource focuses on the surface mounted electrodes as they are inexpensive and most commonly used, therefore best suited to this learning resources target audience as it covers the equipment they are most likely to encounter in practice. Two electrodes are required (active and indifferent) to generate a flow of current, however these can be unipolar or bipolar in configuration. Unipolar is when one electrode is more active than another due to their sizes. The active electrode is typically smaller and placed near the nerve to be stimulated with the indifferent electrode placed over less excitable tissue such as fascia. In multi-channel configurations there are several active electrodes but only one indifferent electrode is required . Biploar electrodes are both the same size meaning the current at each site will be equal. Both active and indifferent electrodes are placed close to the stimulated nerve and in multi-channel configurations there is an indifferent electrode for each active. Bipolar systems enable greater targeting of muscles . One other variable is whether the timing of when electrical stimulation is active is via a button, cyclical or EMG-triggered system. The button method is a manual form of ES and requires the user to actively press a switch to activate the stimulation. Cyclical means that the timing and sequence is predetermined by selection of an appropriate programme on the device and this is sometimes just referred to at NMES . 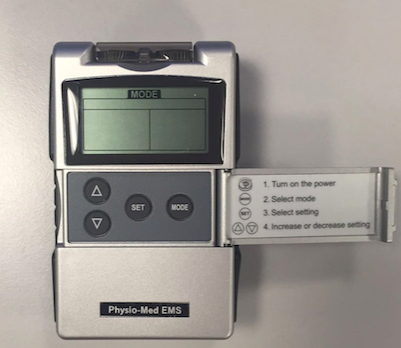 Alternatively, the EMG triggered system uses sensors built in to the active electrode to determine when voluntary muscle contraction is above a preset-threshold which then triggers the ES . It has been suggested that this method promotes greater user involvement promoting neuroplastic changes and leads to better outcomes . Typically this is called EMG-triggered ES to differentiate from cyclical . Cyclical or predetermined programs are considered open loop systems that rely on the user to turn-on/off whereas EMG-triggered are classified as closed-loop systems as the EMG trigger determines on/off timing. There are various parameters that can be adjusted on ES devices to help tailor the electrical field effects to the patient and its intended application. Table 1. below outlines each parameter and its definition. It is worth noting that not all ES devices allow individual control of all parameters and many offer a choice of pre-determined programmes. Odstock medical is one of the main suppliers of ES devices, which vary in design and parameters available. They provide systems for use in the home environment, allowing regular activity and independence. The stimulators differ in the outputs they provide, including single or multichannel systems, with different outputs available. When should I use Electrical Stimulation? 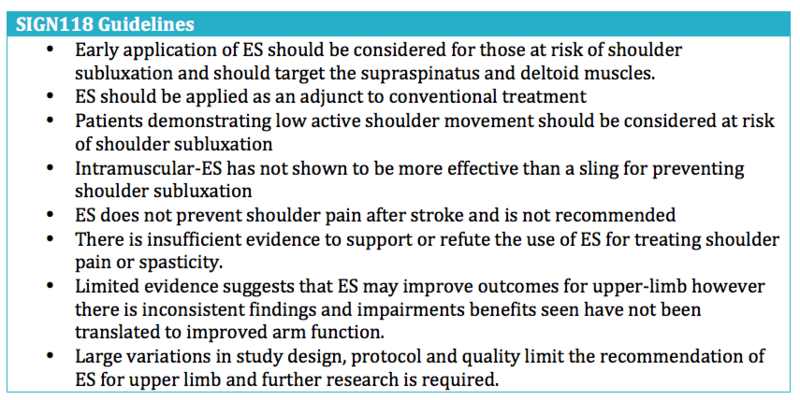 Overall there is general consensus and robust evidence to support the use of ES in the management of shoulder subluxation and this features in both the SIGN and RCP guidelines. However the findings for ES are not ubiquitous for other uses, including motor control, spasticity and shoulder pain. While ES to improve motor control does appear to have a growing evidence-base in the underpinning literature, it is unclear whether the gains reported translate across to meaningful arm function improvements such as activities of daily living or improved participation. Additionally considerable limitations exist within the trial, including small sample sizes and lack of blinding that increase risk of bias and reduce confidence. Large variation in trials was also a limiting factor with different types of ES used, and significant variation in dosage, intensity and time since stroke making for large heterogeneity. This limited the ability to use pooling and meta analysis which can improve statistical power. Finally few studies report sufficient follow-up periods therefore gains that have been reported are questionable as to whether these effects have long-term carry-over from treatment. Taking all this into account it is clear why current evidence is not sufficiently robust to recommend routine use of ES therapeutically to improve motor control and arm function but as side-effects are minimal its use as an adjunct in a trial approach is merited. Figure 8. Summary of the Guidelines. The recommendations in the guidelines were formulated based on review of the evidence base. 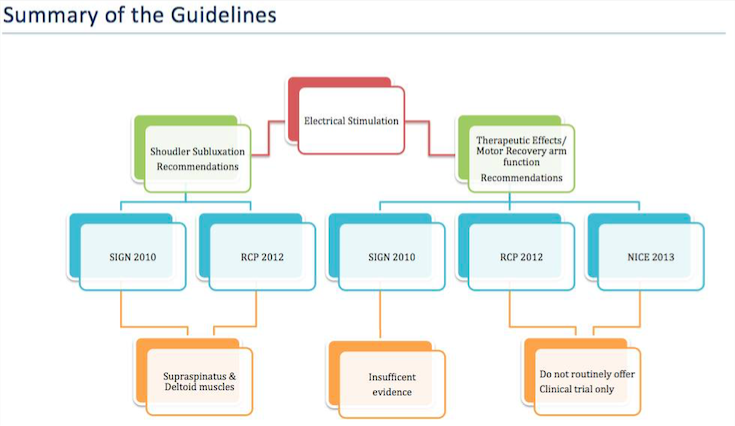 Of the three guidelines bodies, only two have consistency in recommending ES for treatment of those with, or at risk of, shoulder subluxation   This is supported by a robust evidence base . 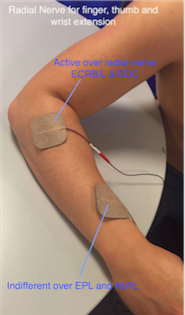 Additionally, both the NICE  and RCP  guidelines state that therapeutic ES, to improve arm function by promoting motor recovery, is not routinely recommended and should only be considered as a clinical trial. SIGN have stated that there is insufficient evidence to support its use in this manner also . Systematic reviews (SR) are considered at the top of the evidence hierarchyand Cochrane are considered by many as the gold standard . A Cochrane overview reviewing the effectiveness of interventions for the recovery of upper limb function after stroke was recently produced . R This was in response to overwhelming amount of SR for stroke upper limb published which creates difficulties for clinicians in identifying which were the most robust sources. 40 SR’s were included, of which 3 SR’s were in relation to ES. The Cochrane review concluded that there was only low-quality evidence related to the use and effectiveness of ES. Difficulties due to the large variation in trials limited the ability to combine results to gain greater confidence in findings . Additionally, it was not possible for indirect comparisons to be made between ES and other interventions due to the heterogeneity of trials and the use of different outcome measures. Variation included different treatment protocols, dosage and time since stroke (chronic vs acute). Overall the conclusion was that there was insufficient high quality evidence to support a change in clinical practice and further research was required to verify some of the beneficial treatment effects reported. Since the Cochrane review, Howlett investigated FES in improving activity after stroke compared with training alone and is the most up to date SR found in our literature search. Howlett investigated whether FES was effective in improving activity after stroke when compared with no treatment or training alone. Statistically significant standardised mean differences (SMD) were reported in favour for ES for activity when compared with no treatment or placebo. FES was also beneficial to activity when compared with training alone. However, the authors were unable to determine whether FES activity benefits improved participation or if activity benefits were long-lasting. Using SMD was also necessary as studies used different outcome-measures which means that although large effects-sizes were found for upper limb, it was difficult to translate this into real term, therefore clinical significance for FES in upper limb was unable to be verified. In light of the variation of practice of ES for stroke within Scotland, a forum was established to present guidance on the application of ES for stroke recovery which resulted in a ‘Consensus statement’ document being published . This document draws together guideline recommendations, key literature appraisal and makes practical recommendations on device parameters to try and offer guidance to clinicians and address skills and knowledge barriers. ES has a developing evidence base and is recommended for use within the national guidelines although this is not consistently applied. Its use is generally considered as an adjunct to standard treatment rather than a stand-alone intervention such as promoting greater task based practice. Evidence supporting the use of ES for reduction of shoulder subluxation is robust for treatment in the early phase. Evidence supporting its use is less conclusive for improving motor control to aim improved arm function. While benefits have been shown they do not always transfer to meaningful improvements in activities or ADL’s and limited studies have investigated benefits with long-term follow up. The evidence base is currently limited by the small sample sizes, limitations in methodological quality and large variation in protocols and dosage prohibiting pooling. That said, there is a trend emerging that ES can offer a therapeutic effect and benefits may extend beyond treatment, however, further high-quality research is required to validate this. How do I use Electrical Stimulation? ES can be applied by qualified health professionals; including physiotherapists and occupational therapists who are competent in its use. Although this learning package gives a theoretical overview of ES we advise that practical training is performed before applying this as a treatment . The checklist below details what training is required prior to use of ES. To ensure patient safety it is important to consider the contraindications and precautions before using an ES device. Understanding these will help make an informed decision regarding the use of ES as a treatment. Table 5. Summary of the main contraindications and percautions. Prior to commencing treatment the patient needs to give verbal consent. After they have given consent it is important to provide the patient with information regarding ES. They should be informed of the expected skin sensation and that it may uncomfortable, but they should not experience any pain. Patients should also be told what to do if they experience these sensations and how to work the ES device if a patient or carer is able to adjust it. Providing an instruction manual in lay terms may be beneficial for the patient. Contraindications and precautions should be highlighted to the patient with relevant information explained to them. After providing the patient with this information, it should be documented in the patient notes . Outcome Measures: There are a variety of outcome measures that can be used in the monitoring of upper limb recovery and function post stroke, which could be used to track progress of patients using ES. Two of these outcome measures will be outlined below. The MAS File:Motor Assessment Scale.pdf is an outcome measure which focuses upon functional motor activities. It has specific sections for Supine to side lying, Supine to sitting over side of bed, Balanced sitting, Sitting to standing, Walking, Upper-arm function, Hand movements, Advanced hand activities and general tonus. Each of these are scored from 0-6. A score of six is the optimal motor score in each area, with a score of 48 being available in total . The Wolf Motor Function Test is a timed outcome measure which aims to assess how quickly functional upper limb tasks can be performed. Patients are given 120 seconds to complete each task before the task is marked as incomplete. Each of these are scored from 0 to 5. Five is the best score achievable for each task, with 75 being the maximum score available . Inferior glenohumeral joint displacement, commonly known as Shoulder subluxation is a secondary musculoskeletal impairment amongst patients with extreme muscle weakness and limb inactivity . Incidence rates are reported between 17%-81% of people who suffer a stroke, with greater paralysis related to higher incidence . Weakness of the shoulder musculature can result after a stroke, leading to subluxation due to the muscles being unable to hold the humerus within the glenohumeral fossa against the pull of gravity . How does ES aid in Shoulder Subluxation? UK national guidelines recommend ES of the upper limb post stroke to prevent shoulder subluxation . This is supported by a robust evidence base  . Subluxation appears to develop during the flaccid period, typically the first 3 weeks post stroke, and shoulder subluxation is less likely to occur if the supraspinatus has developed some movement . Furthermore Linn and Fil  stated that early application of FES, preferably within the first 48 hours post stroke is vital in achieving positive results. While benefits have also been shown when applied within the first 2-3 weeks, they are less effective  and it has been suggested that once the capsule and soft-tissues around the shoulder are stretched then may persist . Therefore early application of ES is recommended and has shown to improve function, muscle tone, joint alignments and sensory deficits . Caution has also been advised for those with more severe paresis, however, as some patients have shown a delay in restoration of motor control as a result of treatment, therefore the benefits need to be weighted appropriately . While evidence supports the use of ES in the acute stage, there is less agreement between researchers in chronic stages of stroke . Some benefits for patients in the chronic stages of stroke have been reported however they were not statistically significant   although limited evidence exists in this stage, therefore further evidence is required for a definite conclusion . Guidelines and evidence advocate stimulation of the supraspinatus and deltoid muscles   . Stimulation of the supraspinatus alone has been shown to be inadequate in maintaining the humeral position of the shoulder . Although the evidence for the supraspinatus and deltoid muscles are robust, a more recent study by Manigandan  found that additional stimulation of the long head of biceps improved effects on preventing shoulder subluxation. This could be an alternative treatment option if stimulation of the supraspinatus and deltoid muscles prove ineffective. How do I identify a patient at risk of a shoulder subluxation? Evidence supports treating both those with shoulder subluxation and those at risk of developing it  . An audit by Macdonald reported that 100% of patients who developed subluxation had low tone, concluding that patients with either flaccidity or low tone around the shoulder with reduced active ranges of motion could be considered at risk. 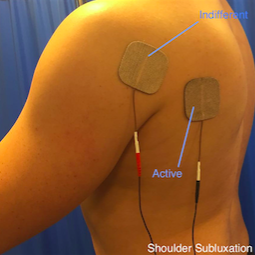 However a caution was raised that only 50% of patients with the risk of shoulder subluxation would be suitable electrical stimulation and therapists should use their own clinical reasoning and judgment to screen eligible patients. Therefore, a criterion was developed for the assessment of patients whereby if patient’s presented with one or more of the following characteristics they would be considered ‘at risk’. The extracted characteristics are presented in the table below . Another audit by Larkin supports the table mentioned above and further presents a table to address some of the concerns about the suitability of ES for patients. The table below shows the suitability for ES. These 2 audits have shown the characteristics towards identifying a patient ‘at risk’ and some of the concerns towards the suitability of patients for ES. Another measure reported was the use of the motor assessment scale (MAS). Linn reported that patients who scored two or more on the MAS did not develop shoulder subluxation. This could be an alternative outcome measure when assessing an ‘at risk’ patient of shoulder subluxation and used a criteria to cease treatment. For clinicians who intend to use ES but are unfamiliar, the pathway below can provide guidance towards using ES in clinical practice. Figure 9. 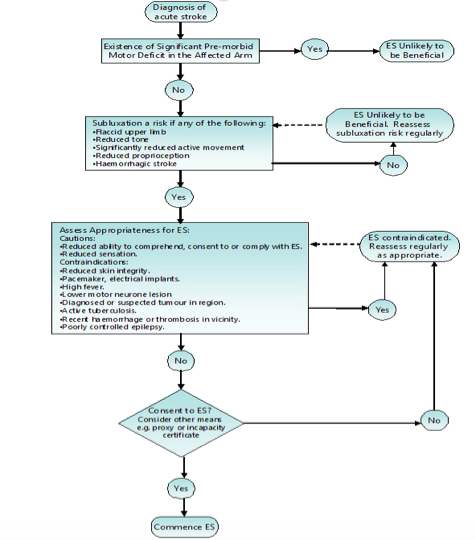 Flowchart for identify patients at risk for shoulder subluxation. Before applying ES to the upper limb to assist reduction of shoulder subluxation, you should consider the movement you wish to illicit and the structures involved in this movement. Below are some illustrations of ES being used with slight variations. The settings below are by Odstock Medical Limited who are one of the main distributors of ES in the UK. This is using a dual channel device. A quick guide would be for all 4 electrodes fitting under the hand of the clinician over the patient’s shoulder. When adjusting the current to relocate the position of the humerus, extensive shoulder abduction should be avoided. 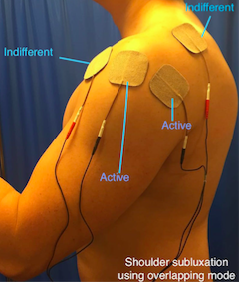 If a single channel device is only available, place electrodes over middle deltoids and supraspinatus. Polarity to which is active can be adjusted, if too much shoulder abduction is observed, switch polarity of active to supraspinatus instead of middle deltoids. Figure 10. Shoulder subluxation (overlapping mode). This is suitable for patients with significant anterior subluxation/ internal rotation of the humerus. You can adjust which electrodes are active or indifferent depending on your patient’s needs. This set up should relocate the humerus more posteriorly. The current levels may be too high when the shoulder is brought into elevation and you should adjust the current where appropriate to achieve humeral relocation. If the shoulder is subluxed without any rotation, place the electrodes over the middle fibres of deltoid and supraspinatus. Stimulation of the supraspinatus may be challenging due to the lack of stimulation to the trapezius which would result in shoulder elevation. If that occurs, replace the electrodes over the middle and posterior deltoids. • For Figures 1 & 2 choose which electrode to make active (Strongest effect) i.e. 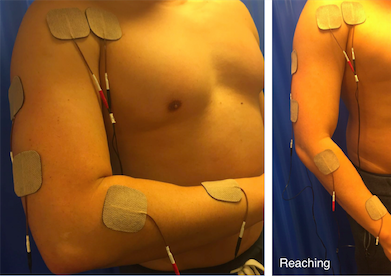 if active electrode over teres minor causing extensive external rotation, reverse the polarity. • Dual channels of stimulation can be applied or alternation of electrode positions. 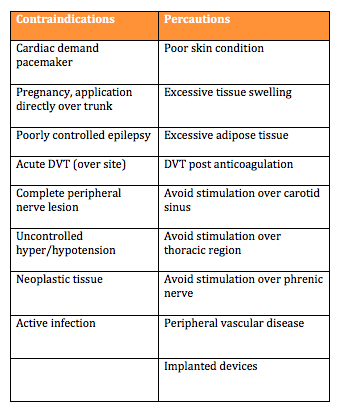 Before commencing with ES treatment on a patient, it is important to consider the parameter settings available and decide upon the most appropriate settings for your patient. The different types of settings used can provoke various responses from patients. A diverse range of frequencies has been reported in the literature. Salisbury reported that 40hz is sufficient to elicit a contraction, however Ada and Foongchomcheay  reported that any frequency range above 30Hz would be sufficient for muscle activity. Furthermore, Baker and Parker  stated that a range between 10 – 60Hz could also be sufficient. Therefore, there is inconclusive evidence towards a specific stimulation frequency and clinicians should use their own clinical judgment to achieve a tetanic contraction. Although 20 – 30 Hz is the most commonly reported. Pulse amplitude, width and frequency have been described as the most important factors in achieving a visible contraction. Although many trials do not state or justify their amplitude and width settings a standard pulse width of 300µs has been suggested as a starting point . However the general consensus of various authors reports values between 100-350µs . Key factors to consider during selection of pulse amplitude and width are muscle fatigue and patient comfort . The quality of underpinning research however is low  and therefore further research is warranted to uncover the full effects of pulse amplitude and pulse width. Evidence regarding the length of treatment is inconsistent due to various individual session durations and overall length of treatment varying between studies. Ada and Foongchomcheay  synthesised the evidence and recommended that ES be initially applied for1 hour per day and gradually increased to 6 hours per day. It is recommended patients should continue with the treatment until they have a score of more than four on the MAS outcome measure to reduce the reoccurrence of a subluxation. Chantraine et. al.reported that improvements could be seen within the first 12 months of treatment and none thereafter with progress being maintained when re-measured at 24 months. There are no definitive guidelines or evidence justifying the specific types of waveform, ramp times and on/off cycle time when treating a subluxed shoulder. However a slower ramp –up time of at least 2 seconds is recommended when spasticity is present as a sudden contraction would elicit a stretch reflex resulting in a reduced range of motion and a long ramp could also be beneficial towards reducing tone . The general consensus is in conjunction with conventional therapy, ES should be considered in the acute stages, ideally the first few days post stroke, when flaccidity is present and shoulder subluxation risk is high. The use of ES as a treatment for preventing shoulder subluxation and those having shoulder subluxation post stroke is advocated  . Furthermore, early application of ES as an adjunct to traditional therapeutic treatments have proven to be more superior to conventional therapy alone. Subluxation tends to occur within the flaccid period in the first 3 weeks post stroke. The main muscles targeted for stimulation are supraspinatus and deltoids however the evidence varies with regards to which deltoid fibres prove most beneficial. It may depend on the type of subluxation your patient may have i.e. anterior or inferior subluxation. ES should be commenced for one hour per day initially and subsequently increased to 6 hours per day . The recommended dosage of ES is that patients should continue with the treatment until they have a score of more than four on the motor assessment scale (MAS) , however this was in adjunct with improved levels of motor control. Furthermore, patients who scored two or more on the motor assessment scale (MAS) did not develop shoulder subluxation . MAS can therefore be used as an outcome measure when treating patients post stroke, in the monitoring of shoulder subluxation. There is increasingly more evidence supporting the use of ES in shoulder subluxation post stroke. Currently, there is good quality evidence to show that ES should be considered during the acute stages of stroke being it either used for the prevention or treatment of subluxation. However, further research is required regarding the device’s parameters due to the variations of study designs and treatment constraints. Mr Moses is a 70 year old retired male living with his wife. He suffered a left sided transient ischemic stroke three weeks ago and has been diagnosed with right sided hemiplegia. It was noted through an initial physiotherapy assessment that He had low tone, slight loss of sensation and a significant reduction of active shoulder movement with some internal rotation. However, upon further examination and investigation of the medical staff, the patient was shown to have a tuberculosis in the past, poor skin integrity and oedema of his left shoulder and left hand respectively. Additionally, due to the stroke, Mr Mose’s cognition has been affected and therefore his wife now has power of attorney. A colleague has approached you to help with the diagnosis and for some advice due to the lack of improvements from conventional physiotherapy treatments. You are the clinical specialist in treating patients with FES. Would FES be beneficial towards this patient? 1. Using the criteria above, is Mr Moses ‘at risk’ of a subluxed shoulder occuring? What are the features that deem him ‘at risk’? 2.Identify some contraindications or cautions that may affect his eligibility of ES? If so, why? 3.Could you recommend potential electrode placements and why? 4.What are the 3 main factors that need to be considered when choosing appropriate parameters? 8 months on, Mr Moses has made a significant recovery and is being reviewed for discharge. However, his wife is concerned about him returning home, as she is keen for him to continue progress with the use of FES as she has seen the benefits this has. She has approached you to enquire about purchasing an FES device independently to continue in Mr Mose’s rehabilitation and self management. 1. Now have a think about some of the requirements you would expect from an FES device, which would enable a patient to use at home. 2. Having read about the possible interventions and evidence, reflect upon a situation whereby, a patient has informed you that he would like to purchase an FES device for home use even though he has been using FES for more than a year. What advice would you give this patient and why? It is often common for individuals to be left with a motor control deficit on their hemi-paretic side following a stroke. Many sufferers are left with controlled flexor synergy. This can cause difficulties when performing activities of daily living. Electrical stimulation (ES) in patients with motor function impairment of the upper extremity has been employed as a rehabilitation modality for many years. In order for ES to beneficial as a treatment for motor control, it is reported that patients should have some degree of movement. NICE  suggest that patients should be able to hold a contraction but may not be able to move their arm against resistance. The proposed mechanism for upper limb motor control ES is to strengthen the elbow, wrist and finger extensor muscles, reduce the spasticity of the antagonist muscles and help to promote nueroplastic changes . However, there is a limited evidence indicating that repeated muscle activation using ES may lead to improvement in voluntary motor control and providing a carry over effect . How does ES aid Motor control? It is understood that when a muscle contraction is produced by electric stimulation, a whole range of sensory inputs are produced. This includes the direct sensation from the stimulation and proprioceptive feedback from joints, tendons, muscles and mechanoreceptors. This causes a significant increase in the activity along the intact pathways to the cortex, stimulating the production of new synpatic connections . The increased level of motor neuron excitation will also make it easier for weak descending inputs to activate the motor neuron and therefore help to produce a voluntary contraction . When using ES to improve motor function it is often useful to combine muscles to produce a larger pattern of movement, similar to the combination of movements in ADL’s. Overall the placement of the electrodes is key to achieving a comfortable, effective movement for the patient. It is important to ask the patient to assist with the movement, however this voluntary effort must not be so great that it causes a rise in spasticity and inhibits the desired movement. The images below indicate the electrode placement and the functional movement they help to produce. 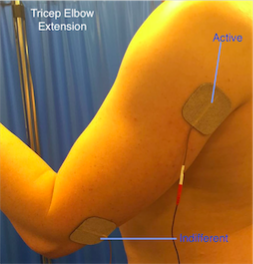 • The triceps can be activated placing an active electrode over its motor point and the indifferent over the tendon at the elbow. • Due to the size of the muscle it is useful to use larger electrodes, which may help produce a more effective movement. • Practicing ‘table polishing’ by sliding the hand over a table using a cloth to reduce friction can be useful. • This is best achieved by stimulation of the radial nerve, which produces an extensor pattern. • It is often a problem to get good thumb extension so it is good practice to place the indifferent electrode over the motor points of extensor palmaris longus and abductor palmaris longus, about three fingerbreadths proximal to the wrist. 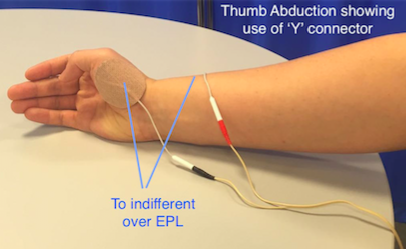 • If thumb extension is still not good, make this electrode the active, assuming this does not significantly reduce finger and wrist extension. • Care should be taken to avoid either radial or ulna deviation of the wrist. If there is excessive ulnar deviation, move the active electrode towards the extensor carpi radialis brevis on the radial side of the arm. If radial deviation occurs, move the electrode towards the ulna side and the extensor carpi ulnaris. • Radial nerve stimulation can be effective at opening the hand but thumb extension alone can leave the thumb in a less than functional position. • Abduction and opposition can be produced by stimulating the thenar eminence. • Place the active electrode over the motor point of Abductor poliicis brevis or opponens pollicis and the indifferent over the back of the wrist. To combine this movement with a general extensor pattern it can be useful to use a ‘Y’ connector. • It is often useful to combine muscles to produce a gross pattern of movement, similar to the combination movements used in every day life. In this way it may be possible to more effectively re-train function rather than by practicing individual muscle activity. • Reaching is where finger, thumb and wrist extension from radial nerve stimulation are combined with elbow extension and shoulder flexion by all channels on together. There are a wide variety of dosage and parameters in the literature. However, the SSAHPF has been developed to provide guidance for the recommended dosage and parameters for upper limb motor control recovery after stroke. Before selecting ES as a treatment it is important that you are aware of the different dosage and parameter settings and how these will affect the treatment. In order to achieve a muscle contraction and minimise patient discomfort and fatigue while maximising clinical benefits has been reported as 12.5Hz . However, it has also been reported that somewhere between 20-50Hz is appropriate  with lower frequencies required for the upper limb . To achieve greater muscle force generation through recruitment of neurons increasingly further from the electrode, pulse amplitude and pulse width may (usually 200-400 micro sec) need to be adjusted ,. It has been suggested that the intensity frequency and pulse width of electrical current should be adjusted in order to produce a visible contraction. Although there is agreement in this area, there is still variability in application and the final decision will fall to the clinician when addressing the individual patient. Common doses and duration of treatments delivered range from 30minutes once per day to one hour three times per day for two weeks to three months although this was not substantiated or justified by the original authors. Hsu  randomised 95 participants to dosages of 0, 15, 30, 60 minutes of ES five times per week for four weeks and reported improved recovery in the upper limb with more intensive ES. However, de Kroon  suggested that the particular treatment parameters may not in fact be the critical element in the efficacy of ES within their study so it may be that individual patient treatment approaches may be sufficient. Most evidence does not justify the choice of ramp times, stimulation wave forms or on/off cycle times so recommendations regarding these are difficult to make. However, Hsu reported cycles of 10 seconds on 10 seconds off in the first two weeks and 10 seconds on and 5 seconds off in the second two weeks. It is important to take into consideration whether the patient has any upper limb tone or spasticity. The dosage and parameters may need to be adjusted for these. Sailsbury  suggested that if spasticity is present then a slower stimulation with a longer ramp time may be beneficial. Currently there is a limited amount of evidence to support the use of ES for upper limb motor control. A number of articles have been synthesised and below are their detailed findings. A systematic review by Vafander , found that the use of ES does not have any significant benefits over conventional treatment. A number of the articles included focused on early intervention after stroke, and concentrated on methods to measure impairments (spasticity, strength and joint motion), not function or activity. These articles showed positive benefits of ES for motor control, however it is unclear if improvements in muscle activity and joint motion can be translated to improvement in motor function. The studies that found no superiority of ES over a conventional treatment tended to be of higher quality and mostly used methods for measuring function or activity instead of impairment. A very limited number of articles concentrated on the use of ES in the later stages of recovery after stroke. Two out of the three studies found positive benefits, however once again these focused on impairments. This systematic review highlighted the need for further research into the effects of ES on upper motor function after both the early and late stages of recovery post stroke. Although there is a lack of evidence showcasing the benefits for ES as a treatment on it’s own for upper limb motor function, one study has indicated when used in conjunction with other therapeutic techniques there is an improvement in an individuals motor control. Hara  found that individuals that receive motor, proprioceptive, and cognitive inputs through the daily use of ES may demonstrate significantly greater improvements in voluntary movement and functional use of the hand and arm. Another article by McCabe  , suggested that for severely impaired stroke survivors with upper limb dysfunction the use of ES combined with motor learning (5 hours per day partial and whole-task practice of complex tasks) helped to improve coordination and functional task performance. However, when analysing the effectiveness of motor learning and ES, compared to motor learning alone or in conjunction with robotics there were no significant differences. At this stage it is hard to say whether ES is an effective treatment due to the limited literature. Future research is needed with a greater consistency throughout the studies. More studies need to be undertaken with larger sample sizes, the use of ES in early and late stages of rehabilitation after stroke being explored. Furthermore, the use of standardised outcome measures for function and activity will strengthen the generalisabilty for the use of ES for upper limb recovery post stroke. Mrs Jones is a 62 year old women who lives alone and had a hemiplegic stroke two months ago. Following her stroke she has found activities of daily living more difficult. She is displaying a classic flexor synergy and as a result is struggling to grip, as well as extending the elbow. Mrs Jones also suffers from spasticity in her left arm. As a result she finds dressing and cooking particularly difficult. Mrs Jones was previously very active and wishes to return to higher levels of function. She has been progressing well however recently her progress has been beginning to plateau. You have discussed with your superviosr and have agreed to trial ES to support your sessions. 1.How do you think ES could benefit your treatment sessions and support progress towards her goals? 2.What factors would you have to take into consideration when treating Mrs Jones? 4.Using the guidelines and underpinning evidence, what considerations would you take when setting the parameters? 5. Consider how you would determine the treatment and overall dosage and intensity? To check your decision making, refer back to the recommended reading of the SSAHPF document,  linked previously. Thank you for completing this learning resource. We hope you have found it useful and engaging. The resource was aimed at final year students and newly qualified physiotherapists, in order to develop their competency in the use of ES for upper limb recovery after stroke. While completion of this package does not fully equip the learner to start applying ES in the clinical setting without guidance, it should enable the user to identify what further learning and support is required to make this transition, resulting in an appropriate action plan. The final activity below aims to drive this process. Learning outcome 1 aimed to develop your understanding of the guidelines and evidence base through a series of activities leading to synthesis of key literature and recommendations. By having an understanding of this the user is able to support appropriate consideration when treatment planning. Learning outcome 3 aimed to build on the first two learning outcomes. It incorporates consideration of the evidence, knowledge and application of the device, and through case studies the learner is asked to consider the appropriateness of ES and how they could integrate it into treatment planning as well as how they would conduct the intervention through electrode placement and consideration of parameters and dosage. These align well with the specific domains -‘assessment and treatment planning’, and ‘interventions and treatments’ of the KSF band 5 physiotherapist role. ES is commonly used in clinical practice in lower limbs however the same frequency of use has not been adopted for upper limbs, although loss of upper limb function is a common consequence affecting a large proportion of the stroke population. There is now robust evidence supporting the use of ES for the management of patients with or who are at risk of shoulder subluxation, supporting its use in clinical practice. There is a developing evidence base for the effects of ES in improving motor control of the upper limbs post stroke, and it is the quality of the evidence available that limits ES being recommended for this purpose. Further research should therefore be carried out in this area to determine the true effect of ES for upper limb within this population. Finally to help support the improvement of this resource, please complete the following survey. The following document by provides an insight into what health professionals need to know prior to using ES. This document provides an in depth information on ES of the upper limb with supporting evidence. 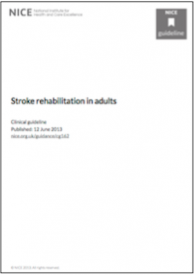 SIGN guidelines showing the management of patients in stroke rehabilitation. NICE guidelines long term rehabiliation post stroke. National clinical guidelines for stroke. Article to compare the response to upper limb using robotics and motor learning comparing to funcational electrical stimulation. Upper limb motor control recovery with functional electrical stimulation post stroke. This book focuses upon basic physiological concepts. ↑ Anderson LW, Krathwohl DR. A taxonomy for learning, teaching and assessing: A revision of Bloom's Taxonomy of educational objectives. New York: Longman, 1998. ↑ Department of Health. The NHS knowledge and skills framework (NHS KSF) and the development review process. http://www.dh.gov.uk/ (accessed 15 April 2015). ↑ Biggs J, Tang C. Teaching for quality learning at university: what the students do. 4th ed. Maidenhead: Open University Press, 2011. ↑ Vark Learn Limited, VARK a guide to learning styles http://vark-learn.com/ (accessed 4 January 2016). ↑ 5.0 5.1 5.2 5.3 5.4 Stroke Association. State of the Nation: Stroke statistics. https://www.stroke.org.uk/sites/default/files/stroke_statistics_2015.pdf (accessed 26 January 2016). ↑ 6.0 6.1 Age UK. Later Life in the United Kingdom. http://www.ageuk.org.uk/Documents/EN-GB/Factsheets/Later_Life_UK_factsheet.pdf?dtrk=true (accessed 8 January 2016). ↑ 7.0 7.1 7.2 7.3 7.4 Pollock A, Farmer SE, Brady MC, Langhorne P, Mead GE, Mehrholz J, van Wijck F. Interventions for improving upper limb function after stroke (Review). http://onlinelibrary.wiley.com/doi/10.1002/14651858.CD010820.pub2/abstract (accessed 8 January 2016). ↑ 8.00 8.01 8.02 8.03 8.04 8.05 8.06 8.07 8.08 8.09 8.10 Scottish Intercollegiate Guidelines Network. 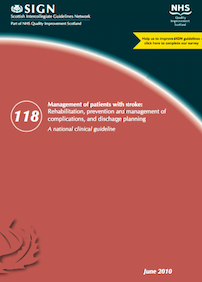 SIGN 118 Management of Patients with stroke: Rehabilitation, Prevention and Management of Complications and Discharge Planning. A national clinical guideline. http://www.sign.ac.uk/pdf/sign118.pdf (accessed 24 January 2016). ↑ The Scottish Government. The Healthcare Quality Strategy for NHS Scotland. http://www.gov.scot/resource/doc/311667/0098354.pdf (accessed 8 January 2016). ↑ 10.00 10.01 10.02 10.03 10.04 10.05 10.06 10.07 10.08 10.09 10.10 10.11 10.12 10.13 10.14 10.15 10.16 10.17 10.18 10.19 10.20 10.21 10.22 10.23 10.24 10.25 10.26 10.27 10.28 10.29 10.30 10.31 10.32 10.33 10.34 10.35 10.36 10.37 Scottish Stroke AHP Forum. Use of Electrical Stimulation Following Stoke: A Consensus Statement. 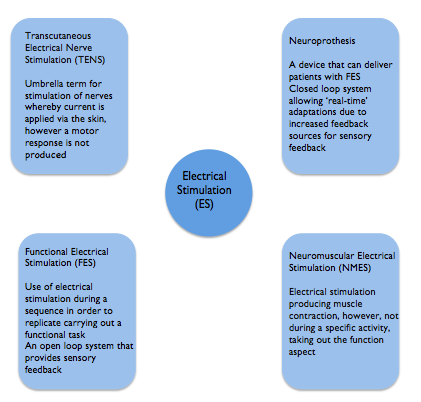 http://www.chss.org.uk/documents/2014/10/electrical-stimulation-consensus-statement-ssahpf-pdf.pdf (accessed 5 January 2016). ↑ 11.0 11.1 11.2 11.3 11.4 11.5 Quandt F, Hummel F. The Influence of Functional Electrical Stimulation on Hand Motor Recovery in Stroke Patients: A Review. Experimental and Translational Stroke Medicine 2014; 6:9. http://www.etsmjournal.com/content/6/1/9 (accessed 18 December 2015). ↑ Odstock Medical. Who Can Benefit from FES? http://www.odstockmedical.com/who-can-benefit-fes (accessed 23 October 2015). ↑ 14.0 14.1 Foley N, Mehta S, Jutai J, Staines E, Teasell R. Upper Extremity Interventions. http://www.ebrsr.com/sites/default/files/module-10-upper-extremity_final_16ed.pdf (accessed 8 January 2016). ↑ Schmidt R, Lee T. Motor control and learning : a behavioral emphasis. Champaign, IL : Human Kinetics, 2011. ↑ 19.0 19.1 19.2 19.3 Howlett OA, Lannin, NA, Ada, L, Mckinstry, C. Functional Electrical Stimulation Improves Activity After Stroke: A Systematic Review With Meta-Analysis. Archives of Physical Medicine and Rehabilitation 2015; 96 (5):1-9. http://www.archives-pmr.org/article/S0003-9993(15)00044-1/abstract (accessed 8 January 2016). ↑ 20.0 20.1 20.2 20.3 20.4 20.5 20.6 20.7 20.8 National Institute for Health and Care Excellence. Stroke and transient ischaemic attack in over 16s: diagnosis and initial management. https://www.nice.org.uk/guidance/cg68 (accessed 19 December 2015). ↑ 21.0 21.1 21.2 21.3 21.4 21.5 21.6 21.7 21.8 21.9 Intercollegiate Stroke Working Party. National Clinical Guideline for Stroke Fourth Edition. Homepage of Royal College of Physicians. 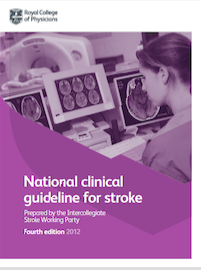 2012. https://www.rcplondon.ac.uk/guidelines-policy/stroke-guidelines (accessed 24 January 2016). ↑ 22.0 22.1 22.2 22.3 22.4 Robertson V, Ward A, Low J, Reed A. 4th ed. Electrotherapy Explained – Principles and Practice. Edinburgh: Butterworth Heinemann Elsevier. 2006. ↑ 23.0 23.1 Neo Stroke Network. 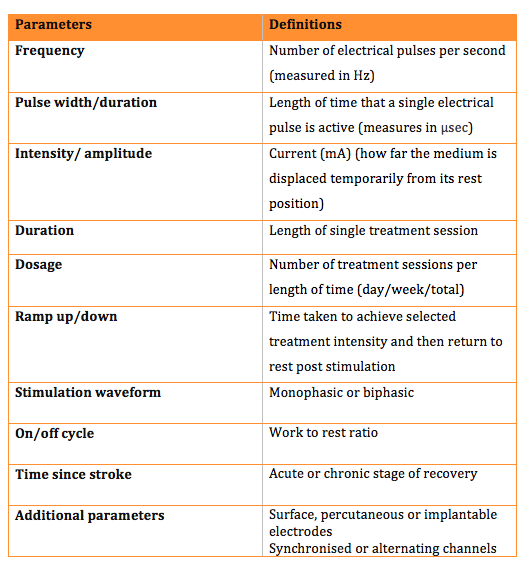 Funcitonal Electrical Stimualtion: “To stim or not to stim”. https://www.neostrokenetwork.com/newportal/Portals/0/Education%20Documents/Everything%20Stroke/Rehabilitation/09-Related%20Presentations/Functional%20Electrical%20Stimulation_a%20discussion%20paper%20by%20L%20Taipalus.pdf (accessed 5 January 2016). ↑ Bear MF, Connors BW, Paradiso MA. Neuoscience: Exploring the Brain, 3rd ed. Baltimore: Lippincott Williams & Wilkins; 2007. ↑ 25.0 25.1 25.2 25.3 Gorman PH, Peckham PH, Functional electrical stimulation in neurorehabilitation. In: Selzer ME, Clarke S, Cohen LG, Miller RH editors. Textbook of Neural Repair and Rehabilitation. United Kingdom: Cambridge University Press, 2014, pp. 120-134. ↑ Dobkins BH, Dorsch A. New Evidence for Therapies in Stroke Rehabilitation. Current Atherosclerosis Reports 2013; 15 (6): 1-9. http://www.ncbi.nlm.nih.gov/pmc/articles/PMC3679365/ (accessed 5 January 2016). ↑ Kawashima N, Popovic MR, Zivanovic V. Effect of Intensive Functional Electrical Stimulation Therapy on Upper-Limb Motor Recovery after Stroke: Case Study of a Patient with Chronic Stroke. Physiotherapy Canada 2013; 65 (1): 20-28. http://www.ncbi.nlm.nih.gov/pmc/articles/PMC3563372/ (accessed 8 January 2016). ↑ 28.0 28.1 28.2 28.3 28.4 28.5 Sheffler LR, Chae J. Neuromuscular electrical stimulation in neurorehabilitation. Muscle and Nerve 2007; 35(5): 562-590. http://onlinelibrary.wiley.com/doi/10.1002/mus.20758/abstract;jsessionid=33B6E38FCCF503F611C557F5541E8788.f03t01 (accessed 4 January 2016). ↑ Thrasher A, Graham GM, Popovic MR. Reducing muscle fatigue due to functional electrical stimulation using random modulation of stimulation parameters. Artificial Organs 2005; 29 (6): 453-458. http://onlinelibrary.wiley.com/doi/10.1111/j.1525-1594.2005.29076.x/abstract (accessed 17 December 2015). ↑ 30.0 30.1 30.2 Ewins D, Durham S, Functional Electrical Stimualtion. In: Watson T editor. Electrotherapy: evidence based practice. Edinburgh: Churchill Livingstone, 2008, pp. 317-326. ↑ Popavic DB. Neural Prostheses for Movement Restoration. In: Moore J, Zouridakis G editors. Biomedical Technology and Devices Handbook. United States of America: CRC Press, 2003. p 9-16. ↑ 32.0 32.1 32.2 32.3 32.4 32.5 De Kroon JR, Ijzerman MJ, Chae J, Lankhorst GJ, Zilvold G. Relation between stimulation characteristics and clinical outcome in studies using electrical stimulation to improve motor control of the upper extremity in stroke. Journal of Rehabilitation Medicine 2005;37(2): 65-74. http://www.medicaljournals.se/jrm/content/?doi=10.1080/16501970410024190 (accessed 24 January 2016). ↑ 33.0 33.1 33.2 Hara Y. Neurorehabilitation with new functional electrical stimulation for hemiparetic upper extremity in stroke patients. Journal of Nippon Medical School 2008; 75(1): 4-14. https://www.researchgate.net/publication/5492468_Neurorehabilitation_with_New_Functional_Electrical_Stimulation_for_Hemiparetic_Upper_Extremity_in_Stroke_Patients (accessed 14 December 2016). ↑ World Health Organisation. Towards a common language for function, disability and health: ICF Geneva: WHO. http://www.who.int (accessed 9 January). ↑ 35.0 35.1 35.2 35.3 35.4 Vafadar AK, Cote JN, Archambault PS.&nbsp;Effectiveness of Functional Electrical Stimulation in Improving Clinical Outcomes in the Upper Arm following Stroke: A Systematic Review and Meta-Analysis.&nbsp;BioMed Research International. 2014;2015(1):&nbsp;1-14. http://eds.a.ebscohost.com/ehost/pdfviewer/pdfviewer?sid=25c0498f-13ec-4520-8d45-310ed8491799%40sessionmgr4005&vid=0&hid=4203&nbsp;(Accessed 24 January 2016). ↑ Veerbeek JM, Van Wegen E, Van Peppen R, Van Der Wees P, Hendriks E, Rietberg M, Kwakkel G. What Is the Evidence for Physical Therapy Poststroke? A Systematic Review and Meta-Analysis. PLOS ONE 2014; 9(2) http://www.plosone.org (accessed 10 January 2016). ↑ 39.0 39.1 39.2 39.3 Allan K, Goodman C. Using Electrical Stimulation A Guideline for Health Professionals. http://www.aci.health.nsw.gov.au/__data/assets/pdf_file/0004/211819/Using-Electrical-Stimulation-January-2014.pdf (accessed 7 January 2016). ↑ 40.0 40.1 Taylor P. Referral Criteria OML Learning Through Technology Precautions.fckLRhttp://www.odstockmedical.com/sites/default/files/referral-criteria_0.pdf (accessed 7 January 2016). ↑ 42.0 42.1 Wolf SL, Thompson PA, Morris DM, Rose DK, Winstein CJ, Taub E, Giuliani C and Pearson SL. Wolf Motor Function Test in Subacute Stroke The EXCITE Trial: Attributes of the Wolf Motor Function Test in Patients with Subacute Stroke Neurorehabilitation and Neural Repair 2005; 19 (3):194-205. http://nnr.sagepub.com/content/19/3/194.long?hwshib2=authn%3A1453766034%3A20160124%253Adbcb3854-3ac8-458b-a4c3-0ae27a7bf028%3A0%3A0%3A0%3AVr%2B4aUt5CRoWfs4DNZJ3Tw%3D%3D (accessed 7 January 2016). ↑ 43.0 43.1 43.2 43.3 43.4 43.5 43.6 43.7 43.8 Ada L, Foongchomcheay A.&nbsp;Efficacy of electrical stimulation in preventing or reducing subluxation of the shoulder after stroke: A meta-analysis.&nbsp;Australian Journal of Physiotherapy.&nbsp;2002; 48(4):&nbsp;257-267.&nbsp; http://www.sciencedirect.com/science/article/pii/S0004951414601653&nbsp;(Accessed 24 January 2016). ↑ 44.0 44.1 Manigandan JB, Ganesh GS, Pattnaik M, Mohanty P.&nbsp;Effect of electrical stimulation to long head of biceps in reducing gleno humeral subluxation after stroke.&nbsp;Neurorehabilitation. 2014;34(1):&nbsp;245-252. http://eds.a.ebscohost.com/ehost/pdfviewer/pdfviewer?sid=e2743008-f009-4d62-8281-bc2a335d2026%40sessionmgr4004&vid=8&hid=4203&nbsp;(Accessed 24 January 2016). ↑ 45.0 45.1 45.2 45.3 Linn SL, Granat MH, Lees KR.&nbsp;Prevention of Shoulder Subluxation After Stroke With Electrical Stimulation.&nbsp;Strokeahajournals.1999;30(1):&nbsp;963-968.&nbsp;http://stroke.ahajournals.org/content/30/5/963.full.pdf+html&nbsp;(Accessed 24 January 2016). ↑ Fil A, Armutlu K, Atay AO, Kerimoglu U, Elibol B.&nbsp;The effect of electrical stimulation in combination with Bobath techniques in the prevention of shoulder subluxation in acute stroke patients.&nbsp;Clinical Rehabilitation. 2011;25(1):&nbsp;51-59. http://cre.sagepub.com/content/25/1/51.full.pdf+html&nbsp;(Accessed 24 January 2016). ↑ Price CIM, Pandyan AD.&nbsp;Electrical stimulation for preventing and treating post stroke shoulder pain: a systematic Cochrane review.&nbsp;Clinical Rehabilitation. 2001;15(1):&nbsp;5-19. http://cre.sagepub.com/content/15/1/5.long&nbsp;(Accessed 24 January 2016). ↑ Church C, Price C, Pandyan A, Huntley S, Curless R, Rodgers H. Randomized controlled trial to evaluate the effect of surface neuromuscular stimulation to the shoulder after acute stroke. Stroke. 2006; 37(10), pp. 2995-3001. http://stroke.ahajournals.org/content/37/12/2995.full.pdf+html (Accessed 14 January 2016). ↑ 49.0 49.1 Foley N, Mehta S, Jutai J, Staines E, Teasell R. Upper Extremity Interventions. http://www.ebrsr.com/sites/default/files/module-10-upper-extremity_final_16ed.pdf (accessed 8 January 2016). ↑ Paci M, Nanneti L, Rinaldi, L A. Glenohumeral subluxation in hemiplegia: An over view. Journal of Rehabilitation Research Development. 2005. 42(4): 557-568. http://www.rehab.research.va.gov/jour/05/42/4/pdf/paci.pdf (Accessed 18 January 2016). 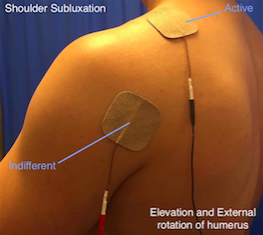 ↑ Kobayashi H, Onishi H, Ihashi K, Yagi R, Handa Y.&nbsp;Reduction in subluxation and improved muscle function of the hemiplegic shoulder joint after therapeutic electrical stimulation.&nbsp;Journal of Electromyography and Kinesiology. 1999;9(5):&nbsp;327-336. http://www.sciencedirect.com/science/article/pii/S1050641199000085&nbsp;(Accessed 24 January 2016). ↑ Macdonald J.&nbsp;An audit of shoulder subluxation in patients within NHS Greater Glasgow and Clyde (NHS GG&C) stroke units, examining incidence, predictive factors, and potential numbers eligible for Electrical Stimulation treatment.&nbsp;SSAHPF.&nbsp;2013;1(1):&nbsp;30-45. http://www.chss.org.uk/documents/2014/10/electrical-stimulation-consensus-statement-ssahpf-pdf.pdf&nbsp;(Accessed 24 January 2016). ↑ 53.0 53.1 53.2 53.3 53.4 53.5 Salisbury fes newsletter. 1. Upper Limb Electrical Stimulation Exercises. http://www.salisburyfes.com/pdfs/upper limb.PDF (accessed 24 January 2016). ↑ Baker LL, Parker K.&nbsp;Neuromuscular Electrical Stimulation of the Muscles Surrounding the Shoulder.&nbsp;Journal of the American Physical Therapy Association.&nbsp;1986;66(12):&nbsp;1930-1937. http://ptjournal.apta.org/content/66/12/1930.long&nbsp;(Accessed 24 January 2016). ↑ Chantraine A, Baribeault A, Uebelhart D, Gremion G.&nbsp;Shoulder pain and dysfunction in hemiplegia: Effects of functional electrical stimulation.&nbsp;Archives of Physical Medicine and Rehabilitation. 1999;80(3):&nbsp;328-331. http://www.sciencedirect.com/science/article/pii/S0003999399901466&nbsp;(Accessed 24 January 2016). ↑ 57.0 57.1 57.2 Sheffler LR, Chae J. Neuromuscular electrical stimulation in neurorehabilitation. Muscle and Nerve 2007; 35(5): 562-590. http://onlinelibrary.wiley.com/doi/10.1002/mus.20758/abstract;jsessionid=33B6E38FCCF503F611C557F5541E8788.f03t01 (accessed 4 January 2016). ↑ 59.0 59.1 59.2 Hsu S, Hu M, Luh J, Wang Y, Yip P, Hsieh C. Dosage of neuromuscular electrical stimulation: is it a determinant of upper limb functional improvement in stroke patients? Journal of Rehabilitation Medicine 2012; 44(2): 125 -130. http://www.medicaljournals.se/jrm/content/?doi=10.2340/16501977-0917&html=1 (accessed 8 January 2016). ↑ McCabe J, Monkiewicz M, Holcomb J, Pundik S, Daly J. Comparison of Robotics, Functional Electrical Stimulation, and Motor Learning Methods for Treatment of Persistent Upper Extremity Dysfunction After Stroke: A Randomised Controlled Trial. Archives of Physical Medicine and Rehabilitation 2015; 96(6): 981-990.fckLRhttp://www.archives-pmr.org/article/S0003-9993(14)01228-3/pdf (accessed 20 November 2015).